Like the Markets and find out the details, dates and time. facebook.com/wellard.markets and get up to date information. The Village Markets at Wellard is an Outdoor Community Market in Wellard Kwinana - Perth Western Australia includes a range of stalls including Arts, Crafts, Organic and Fresh Produce, Homemade and Gourmet Foods, hand crafts, a Delicious sausage sizzle BBQ run by Rotoract, Gourmet Goods, Herbs, Clothing, Children’s Toys, Coffee, Entertainers and plenty of family fun and entertainment for the kids. 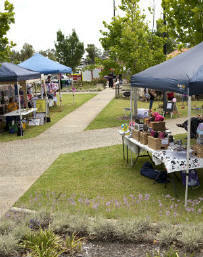 Make the Sunday Village Markets at Wellard outdoor Markets your perfect Sunday family outing. Find a bargain or sell your second hand goods at the Car Boot Sale / Flea market / Swap meet , run by the Rotary Club of Kwinana. Free parking available at Wellard Train Station. Event Food Service was a previous stallholder in 2013 to 2014 selling Delicious Gourmet Hamburgers, Hot Chips, Hotdogs and a Variety of Cold Soft Drinks and Bottled Water. Also Pancakes were available early until sold out. Other Food vendors are also in attendance, including the rotoract Sausage Sizzle.